We love visiting new places and when we heard that a new soft play had opened up in Bournemouth we knew we had to try it. Except this soft play isn't very soft at all. 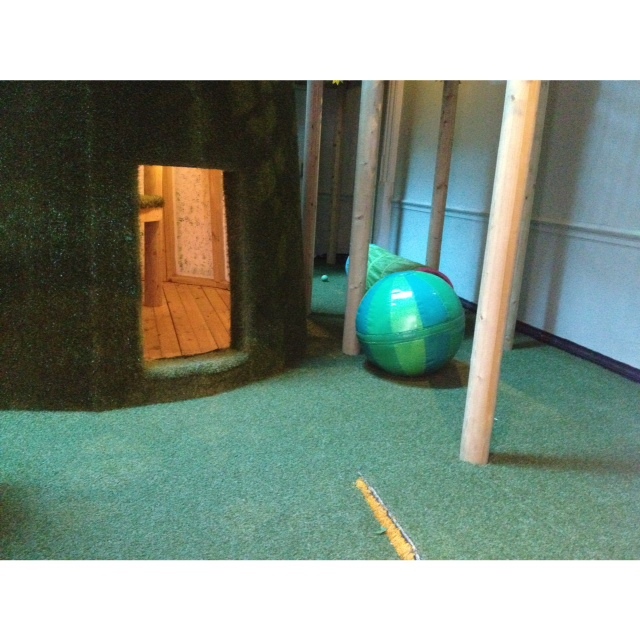 Treehouse Family Play is actually an indoor treehouse with all things wooden, rope and fake grass. It's so refreshing to find somewhere different. There was a gorgeous cafe which served everything from homemade smoothies and juices to gorgeous sandwiches and lunches. You weren't allowed to take any food into the play area but there were some cameras in there so you could sit back and watch in the cafe. As you can see from the photo above there is a gorgeous under 2's bit with everything from our favourite Bilibo to a sensory wall. There were dressing up boxes, tents and a lego wall to play with and thats all before you've got to the tree house! Once you got inside it was clear that this was no ordinary soft play. A mountain of a grass covered house was in the centre with rope ladders, a huge slide and hiding places big enough for grown ups. This place was amazing. So much better than the normal places that are padded cells of colour, this was perfect and completely felt like we were playing with nature. We would have spent a whole day there but just over an hour knackered Max out enough so that he slept soundly at night.